The remnants of "Phet", while passing over the baked and over heated mainland in the Northern/North-Western Sub-continent regions, has precipitated fairly good rains and helped cool down the parched landmass substantially.Ironically,the Thar Desert on either side of the International Border,received the maximum amounts of rain in the past 2 days. And has resulted in bringing a "comfort zone" in the region . In Pakistan, the heaviest rains were given in yesterday's blog, while even on Monday,some heavy falls were measured: (In Cms): Hyderabad=6Chhor=5,Nawabshah=4.Mirpurkhas=2,Chor=2. On the Indian side, the heaviest falls in Rajasthan on Sunday/Monday in cms were: Pokran 12, Jaisalmer 11,Phalodi 9,Jaisalmer Tehsil 9,Nokh 7 and Fatehgarh 6.In Gujarat: Kalyanpur 11, Mandvi 9,Lalpur 8,Rajkot AP 7, Jamnagar 7, Bhuj 6. From an unbelievable 53c in the Sindh onin the last week of May, cities in the region like Sibi cooled down to a high of 38c on Monday. And the late May record heat, with several 52s and 53s in the region, is over and forgotten, with the highest yesterday in Turbat peaking 39c. On Monday, even the the frequent topper, Nawabshah was at 34c. Again,on Monday, 8th. June,traditional hot spots in the Indian Thar Desert region too were in a "comfortable position" temperature wise. Bikaner, yesterday topped 21.9c, 20c below the normal for this day. Night in Bikaner was pleasant at 19.6c (9c below normal). And to think it was 46c just a few days ago ! Most of the Rajasthan/Punjab/Haryana/Gujarat cities are also down to tolerable temperature levels now. Places topping 48c have now come down to the mid 30s since yesterday.Jaisalmer day temperature touching 28c was 13c below normal, Amritsar at 30c was marked 10c below the normal. Delhi's day was at a "comfortable" 32.8c, the coolest 7th. June in 5 years, and Ahamdabad at 31c was 9c below. All these have peaked 45c in the last week of May and early June this year.Hissar, the city which had gone up to 48c, was in the day/night range of 25c and 17.7c ! The remant low has now reached the Himalayan foothills near H.P. 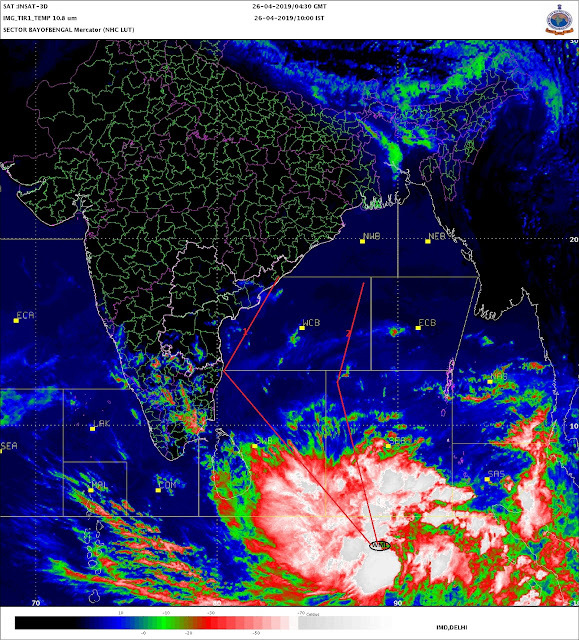 Reaching a couple of days earlier than forecasted, it will soon fizzle out in a day.But we can expect rains in H.P. and Utteranchal on Tuesday, with snow in the upper reaches. High reach tourist spots in H.P.can receive snow, much to the delight of the holiday crowd escaping the heat of the plains. The Arabian sea South-Westerlies now get a full chance,maybe from Wednesday, to re-organise and gain speed to push the monsoon momentum. This could be assisted, it seems likely now, with the help of a "sympathy" low taking shape in the Bay. The low vortex predicted near Goa, may form around Friday, and precipitate heavy rains in the region. The further progress of the monsoon, into Goa and Northwards, can be estmated on these developments. Mumbai:Tuesday and Wednesday, Partly cloudy with a shower or two. Thursday/Friday: Partly cloudy, with a couple of showers, most probably in the afternoon/evening. Weekend will be cloudy to overcast, with heavy passing showers in some areas. 72 mms in Santa Cruz, and 0.3 mms in Colaba. It was a local convection rain.Arrival of monsoon by Sunday/Monday. See Mumbai forecast in blog. Very heavy rain on Tuesday!